Need an excuse to get the weekend started early? Seeking some motivation for a lackluster Chicago day? 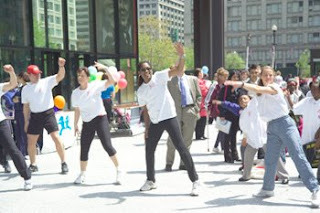 Venture over to Daley Plaza in the loop between 11 a.m. and 1 p.m. for the celebration going down for Chicago Moves Day. The Plaza is filled with activities to get the body and mind moving on the healthy front. You can browse the tents filled with information on good eating, health club deals, giveaways and more. Or stand by for the programs on the main stage that will encourage all in attendance to get moving--think calisthenics warm-up, yoga, dance, even adapted aerobics for those with limited mobility. My favorite session? There are two: the Chicago Police Department and Chicago Fire Department workouts. OK so I haven't been at the event in a few years--blame that on a poor memory and not getting a press release about it--but the firefighters stick out in my mind. More because they were working their arms and legs hoisting fire hoses, squatting and performing perfect push-ups. While I'd love to watch them again--maybe even pick up a few moves to incorporate into my own workout, sans hose, of course--I'm also curious about how the police get and stay fit. And not just those who cruise the streets by bike.